Sorry for the brief review hiatus everyone. I’ve been a little under the weather lately, which means much more reading and tv watching than reviewing. 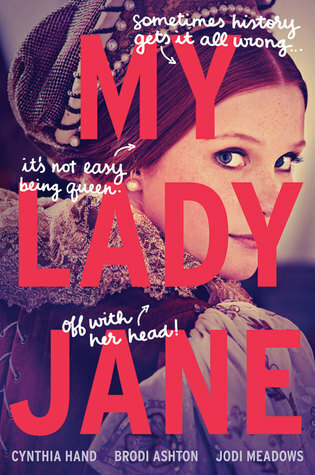 Anyways, I first heard about My Lady Jane from a number of BookTubers that I follow, and decided to give it a go for a couple of reasons: 1. historical fiction is a genere that is not often discussed on BookTube and I was surprised to see this novel keep popping up, and 2. everyone kept talking about how funny it was and I can’t say no to a good laugh! So, a brief synopsis. My Lady Jane presents a very loosely historic recount of the life of Jane Grey and her limited term (9 days) as the queen of England. It’s definitely loosely historical as there is a magical element that definitely makes this a fantasy read as well. But don’t worry; the authors warn readers with a disclaimer on the very first page. Don’t let the fantasy element discourage you from reading My Lady Jane. The authors do a wonderful job of creating a detailed and engaging setting which left me feeling as I was running for my life along with the characters. The adventure is fast paced, but the love story of Jane and G progressed at a wonderfully realistic pace. No insta-love here folks, which I’m sure we will all find refreshing. And I absolutely adored our heroine, Jane. She is complicated, stubborn, passionate, awkward, and driven by her love of books. She is unapologetically herself! Now, I’ll reiterate that My Lady Jane is not historically accurate, but you are made aware of this point through out the story thanks to hilarious interjections by the narrator/authors. This gives it a fireside story telling atmosphere that more serious readers may not appreciate. I do also have to point out that many of the secondary characters and aspects of the plot felt a little under developed. This was definitely evident when looking at G’s hobbies and the whole last quarter of the book. I would like to provide specific details, but I know y’all don’t like spoilers. I heard a number of reviews describing this novel as hilarious. Did I find it hilarious? Yeah, it was pretty darn funny and had a delightfully honest tone that embraced teenage sexual awkwardness without all the tedious angst that is typical of young adult literature. It is fun, and very different which is why I recommend it for readers, especially those in need of a break from serious topics and prose. Have you read My Lady Jane? Let me know what you thought!